This alpine retreat township is a recreational haven of mountains, rivers and lakes offering a huge range of sporting, recreation and leisure activities, through all seasons. Originally established as a services base of the massive Waitaki hydroelectric power scheme, Twizel has proudly grown to a destination in its own right, now home to more than 1,100 residents. 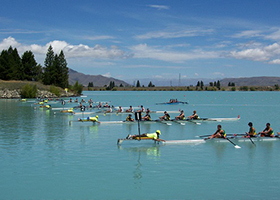 Lake Ruataniwha international rowing & boating. Alps 2 Ocean (A2O) Cycle Journeys and Mountain biking. 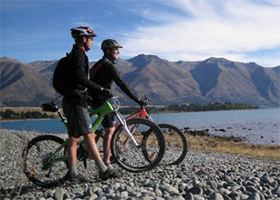 Adventure activities including heli biking, rock and mounting climbing. Kaki Black Stilt breeding hide. Walking tracks, horse trekking and guided alpine tours. Lord of the Rings Tour – explore the film location of Gondor. Winter playground skiing and snowboarding. Experience delicious cuisine from a variety of cafes and restaurants offering flavours and style for every occasion. From gourmet fish & chips, pizza and family café style, authentic Thai and fine fare, enjoy delicious fresh local fare with stunning views to match. Learn more about Twizel's History, a new town - new in that it was constructed as recently as 1968, and "New Town" is the planning definition for the modern layout of the streets, facilities and amenities. Purchase History of Twizel DVD from Twizel Promotions & Development Association (TPDA) For more information phone (03) 435 0066 or email tpda@twizel.info. Video $20 + postage. Shawtys - the best restaurant, cafe and bar in Twizel and beyond. A taste explosion for breakfast, lunch, dinner and anytime between is guaranteed at Shawtys.